A collection of offroad teardrop videos from around the world. P.S. I have edited this to have it flow better and to add links to build journals above the videos. If you share a video of your off road trailer and have a build journal many of us may like to see your build journal too, with a link to it. OK? None of these videos are mine. Just wanted to start something fun for us all to use, enjoy, learn ideas from and share travel adventures. Sort of like planting a seed to see what grows. Last edited by Esteban on Wed Oct 23, 2013 11:56 am, edited 7 times in total. Here is my Jeep and TearDrop taking Mengle pass in 4x4 low with lockers on. 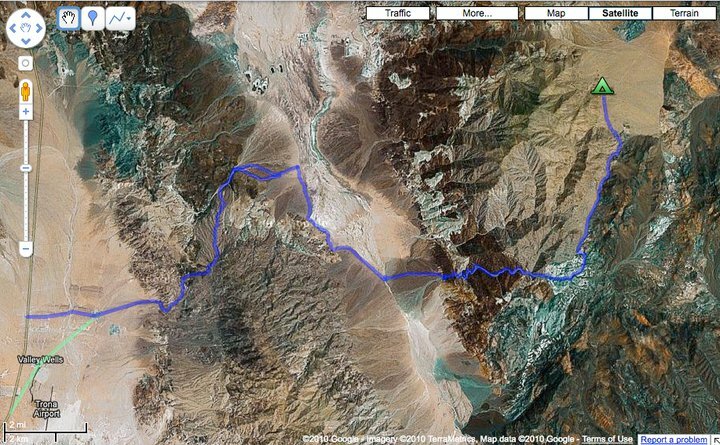 This is our approximate path from Valley Wells (North of Trona) through the “Escape Trail” Fish Canyon, Coyote canyon, Goler Wash, Mengle Pass, to Striped Butte Valley & The Geologists Cabin. Yee Haw!!! Trust me, for those of you who may be unfamiliar with off road 4-wheeling, that was quite an obstacle for a relatively stock Jeep to be dragging a camper thru. Good job! Now I'm curious, Dave, what axles, gearing and lockers do you have installed? I'm assuming 4.0L? KCStudly wrote: Yee Haw!!! Trust me, for those of you who may be unfamiliar with off road 4-wheeling, that was quite an obstacle for a relatively stock Jeep to be dragging a camper thru. Good job! I've got the factory Dana 44 in the rear, and Dana 30 up front. I added ARB air lockers & 4.11 gears to front & rear axles. Onboard air compressor (belt drive off the engine) to run the lockers. Stock straight 6 cylinder 4 liter engine. This is a 1998 Jeep Wrangler TJ with a 4" Currie Jonnie Joint lift. Numerous custom skid plates added under. 21 gallon steel Areo gas tank has 3/8" armor welded on as part of it. The trailer hitch is a LockNRoll. This section of trail is steeper and more curved than it looks. I didn't want to mess around on this section while towing, risking a bunch of 3 point turns if I didn't get up it in the first go, so I locked the lockers from the start. My friends expected a lot more trouble for me there. It was fun though. Last edited by Dave Nathanson on Wed Feb 15, 2017 12:13 pm, edited 1 time in total. Last edited by KCStudly on Wed Feb 15, 2017 12:27 pm, edited 1 time in total.